The story of the Frauenkirche of Dresden is a sign of God's grace that transforms the world. 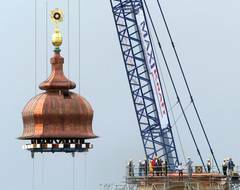 The new cupola cross of Dresden's Frauenkirche is a gift of the British people. The rebuilding of a church destroyed by human hatred and ideology can be a sign of God's transformative grace, says bishop Margot Kaessmann in the following article, reflecting on the theme of the 9th Assembly of the World Council of Churches: God, in your grace, transform the world. 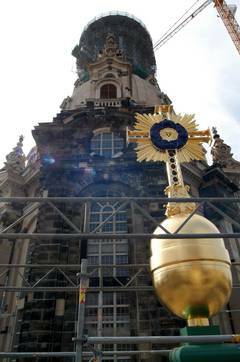 On Reformation day, 30 October, 2005, the Frauenkirche (Church of Our Lady) in Dresden was officially re-opened. For me as for many Germans, this is a sign of the grace of God. Built between 1726-1743, the church was a monument of Lutheran Baroque. As Germany's largest Protestant church, it was a landmark in the city that is called the "Florence on the river Elbe". Less than three months before the end of the second world war, on the night of February 13, 1945, Dresden was destroyed by the bombs of the British Royal Air Force. An enormous fire-storm demolished almost the entire city; even the river afforded no safety. More than 40.000 people, many women, children, wounded people and refugees, died. The cupola of the Frauenkirche resisted the bombing, but the sandstone structure could not cope with the over-1000 degrees heat, and imploded after two days. Yet there was a miracle as well. Some 300 people, mainly women and children who had taken refuge in the church and stayed there until the morning of February 14, all survived! During the time of German Democratic Republic, the ruins of the church stood as a mute reminder of German guilt, a call to engage for peace and to resist war. I vividly remember a peace vigil there organized in the context of the World Council of Churches' conciliar process for justice, peace and the integrity of creation. You could already feel that times were changing, and the ecumenical movement was encouraging many in the churches to stand up for peace and justice. So the ruin was one of the places where the cry for freedom and democracy was clearly heard. The cry "no violence" was taken from the churches onto the streets of Dresden and Leipzig and East Berlin. The non-violent reunification of Germany in 1989 was the consequence. In 1992, the city of Dresden agreed to rebuild the Frauenkirche. Many felt that this was a mistake, and that the ruins should remain as a reminder of the scars as well as the guilt. But, all over the world, many more gave money for the restoration. And so it happened faster than anyone might have imagined. On 22 June 2004, a new cross was planted on the church's cupola - as a gift of the British people! You can still see old stones in the new building: scars of history, scars of life. And people in the so-called secularized East of Germany are going to discover this church. For me, this story of Dresden is a sign of reconciliation, a sign of God's grace that transforms the world, on which the theme of the upcoming WCC Assembly invites us to reflect. All the pride the building has shown is visible again now, but the scars that ideology and hatred bring are also fully visible. With human life, it is the same, I believe. We go wrong, we are misled, but God grants us a new beginning. And even when life is destroyed, when we see no future ahead, only fighting and misery, God will save our lives as God saved those people in the church. That is grace, for those who live as for those who die, because this grace does not end at the borders of life as we know it. God's grace also makes reconciliation possible. It was a special moment when the cross from Britain was put on top of the church. The church of Saxony gave one of the few small replicas of that cross to our church in Hanover as a reminder that, during the years of division by the wall, our two churches stayed in close partnership. For me, God's grace teaches humility and respect for the generations of faith before us. When I visited the church four years ago, I saw what great inventors our fathers and mothers in faith were, long before the innovations of technology. So grace is the source of life, of reconciliation, of hope for peace and justice. And it is a sign of God's vision for this world - sometimes even visible for those who do not believe. When I see all those tourists waiting in long lines to see the Frauenkirche, I think: aren't there indeed many ways for God's word to transform the world and find the way to the heart of the people? (*) Dr Margot Kaessmann, bishop of the Evangelical Lutheran Church of Hanover, is the first woman bishop of her church and the second of three women bishops in Germany. 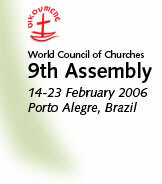 A member of the WCC central committee from 1983 to 2002, she is a delegate to the WCC's 9th Assembly. Among many books, she has written Overcoming Violence: The Challenge to the Church in All Places (Geneva, 2001), and Ecumenism at a crossroads (Ökumene am Scheideweg; Hannover, 2003).